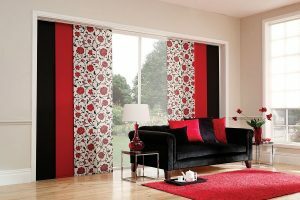 Panel Blinds are a versatile and contemporary way to control light, glare, view and privacy in your home and is an ideal shading solution for larger windows, patio doors, sliding doors and is particularly stunning as a room divider. The panels are available in a wide variety of fabrics including screen fabrics, solar reflective fabrics, faux suedes, woodweave and many other contemporary and traditional fabrics that will enhance the design of any room. The slim Panel Glide track is white powder coated aluminium and has 3, 4, or 5 channels and when open, the panels stack neatly behind one another allowing maximum light to enter the room. Sliding the panels across creates a complete fabric screen providing superior shading and increased privacy. Operation of the panel blind is either by means of a continuous cord loop or a wand that is attached to the leading panel. To further complement any room design, finishing touches can be added including solid wood bottom bar, aluminium bottom bar, eyelets or braid. Whether the Panel Blind has 3, 4 or 5 channels, the panels can either all draw to the right, all draw to the left, or split draw.